K’NEX Brands is a family-owned construction toy company located in Hatfield, Pennsylvania, just outside of Philadelphia. Since 2009, K’NEX has reshored most of its toy construction from China, and now the company manufactures 90 percent of its own parts and 80 percent of its finished products in the United States. K’NEX’s willingness to bring back production and invest in a local supply chain is paying dividends. As the figure shows, the cost to K’NEX of manufacturing in the United States is approximately 19 percent lower than the cost of manufacturing in China. The key source of savings from coming back to the U.S. is in reduced inventory costs. Since the demand for K’NEX toys has a strong seasonal component, the holiday shopping season causes a large demand spike every year. However, estimating the demand spike’s size and timing makes ordering and storing the right amount of inventory an expensive, risky endeavor. Because of its long supply chain, K’NEX had to carry extra inventory, which meant spending on product that might never be needed, and these costs were substantial. Suppose the cost of producing in China is 100 (as illustrated in the figure). The inventory costs required to offset the risk of running out of product (called “timing and forecast” in the figure), accounted for costs equal to 39 in China but only 26 in the United States. The reason the savings were so large is that when the product was coming from China, K’NEX had to guess 12 weeks ahead of time what its customers might demand. Not wanting to risk losing a sale, K’NEX ordered a lot of extra product that might never be sold. When production moved back to the U.S., K’NEX had to guess only a week or two ahead, by which time it had a much better idea how much its customers might demand, allowing it to maintain a smaller buffer. These savings from producing less propagated throughout K’NEX’s balance sheet, leading to secondary savings in sorting, packaging and transportation. In addition, because it maintained less inventory, K’NEX decreased inventory carrying costs from 52 to 47. 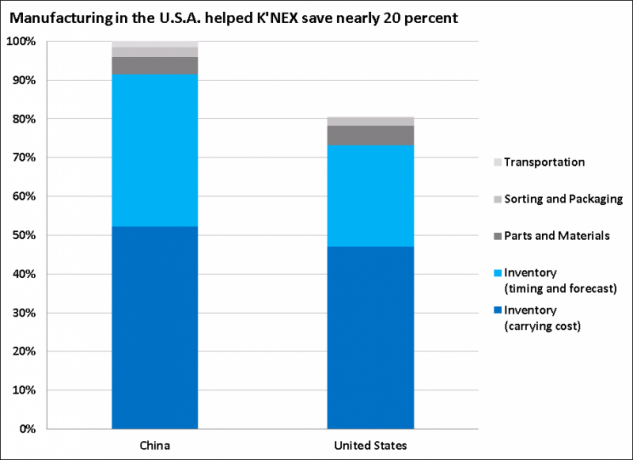 Overall, these two reductions in inventory costs accounted for over 95 percent of K’NEX’s cost savings associated with reshoring. Other efficiency gains have come from increased automation, reduced miscommunication, elimination of time zone differences and better quality control. Direct labor costs are hard to see in the figure, both because they are embedded within processes such as sorting and packaging, and because they are a relatively small portion of K’NEX’s total costs – around 5 percent. For K’NEX, and potentially many other companies, the multiple cost advantages of manufacturing domestically more than offset the lower labor costs abroad. Michael Araten, President and CEO of K’NEX, found that successful reshoring required both belief by upper management that it was possible and a strong local supply chain. Reshoring pays off only when those in charge are truly committed and ready to overcome the inevitable early setbacks. For K’NEX, and for many other manufacturers, the primary difficulty in shifting production back to the domestic market is rebuilding the supply chain locally and redesigning the product to take advantage of their capabilities. This process involved a fair amount of trial and error. Araten even turned to an internet search engine to find contacts – and subsequently tried out several suppliers until one met the desired specifications. Initially, Araten found that supplies did cost more in the United States. Much of his company’s success came from being willing to redesign products and processes to take advantage of local suppliers’ expertise and equipment. For example, K’NEX found a domestic printer whose digital press created an appealing look for the company’s packaging. However, if K’nex had simply reshored the same packaging process it had overseas, the U.S. supplier’s cost was prohibitive. Working with the supplier, K’NEX was able to redesign its package dimensions to fit more boxes on each standard-size sheet of packaging paper, better aligning the design of the box with the capabilities of the printer. This design change lowered the cost per box to be comparable to the foreign supplier’s price. Reshoring does not have to be an all-or-nothing deal in order to be successful. In some cases, such as highly-decorated parts, K’NEX has not yet found a way to make the products in a way that competes with the cheap labor-intensive method used in China, so the company continues to buy these parts abroad. Looking ahead, K’NEX has discovered that reshoring is boosting its innovation. Having production and design together in the same place, along with the advent of 3D printing, allows the company to rapidly build and test new toy prototypes and take them to production in weeks rather than months.